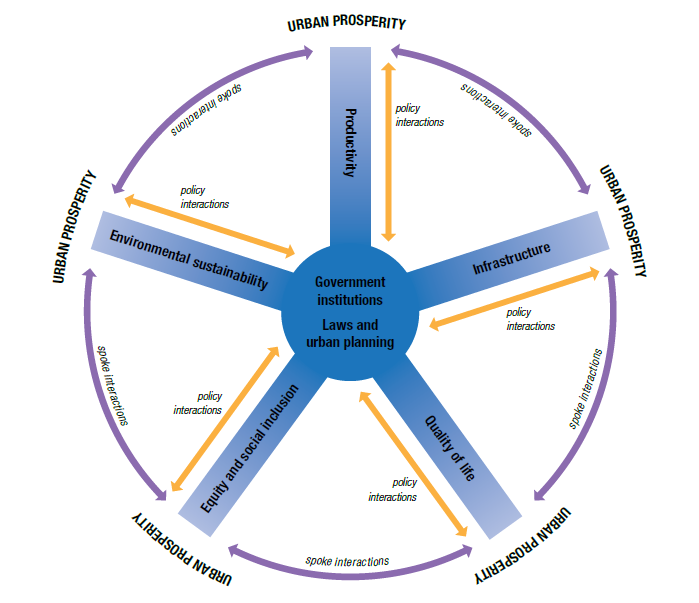 As we saw in the last post, the UN-Habitat’s Wheel of Prosperity has the 5 dimensions of prosperity interacting with each other; and prosperity depends directly on whether these interactions reinforce or undermine each other. Large scale informalisation weakens all the 5 dimensions of prosperity, because informal production seldom gets reflected in the productivity figures of the city – especially as India lacks a proper representational system (guaranteed by a local/state authority) of documenting land deals, goods produced, inventories maintained, or transactions completed. By acting below the tax radar, the informal economy deprives the local government of taxes, and a resource-strapped local body is hardly likely to provide adequate services like health, education, water and sanitation, which directly impacts quality of life. The informal sector thrives in any economy, only because it is profitable for the formal sector to have all, or part of its supply chain in the informal sector. This segment can provide cheap goods and services as it pays abysmally low wages and offers no social security to its workers, as it falls outside the ambit of the country’s labour laws, meant to safeguard worker rights. This means that millions of informal sector workers are perpetually caught up in a poverty trap, generation after generation – a situation exacerbated by the unavailability of affordable or rental housing. In fact I have a simple thumb rule, if according to the decadal Census, x% of a city’s population lives in slums, then x*1.3% of its economy must be in the informal sector! Such high prevalence of urban poverty and the policies which perpetuate it in Indian cities make a mockery of the equity and social inclusion dimension of prosperity. The informal industrial sector is also guilty of the worst pollution in a city, and being unmonitored and unregulated, there is no incentive for these enterprises to clean up their act, so there goes environmental sustainability! So instead, we are happy with news-bites, putting up huge statues of the icons of the day, and providing photo-ops for VIPs sweeping the streets to dump the garbage god knows where! How then, can we go about making Indian cities more prosperous? Primarily by addressing the issues at the hub of the Wheel of Prosperity – Government institutions; and Laws and Urban Planning. Despite almost 70 years of independence, India does not have a national urban policy nor a National Urban Plan. When China opened up, the first thing it did was to invest billions in developing its National Central Cities and business hubs like Pu Dong in Shanghai and Shenzhen near Guangzhou. The Government investment earned magnificent returns, as China went on to become the world’s factory in the following decade. Indian Governments must realise that national investment in urban infrastructure is key to economic growth, and cannot be left at the mercy of the private sector, as happened under JNNURM and is going to happen again under the new regime..
Plus (unlike Brazil) there has been no attempt in India to involve the community in urban management and planning, nor to subsume public housing in urban planning, as in Singapore. Further, taking a lesson from cities which rank much higher than us, we notice one common thread: they all have very strong, enabled and empowered local governments. India needs to follow suit. Although it is over 20 years since the 74th Constitutional Amendment, decentralisation has not really taken off, because only the functions have been delegated to the local level, not the resources, powers or personnel. The New York Police Department (consisting of officers who spend their entire careers serving the city) reports to its Mayor, an elected public official, while Delhi’s Police Commissioner is from the Central Indian Police Service (IPS), posted by the State Government for a couple of years to police the city, and report to some IAS Officer at the State Home Department! The same system prevails when it comes to urban planners, who are responsible not to the local body, but to the State Government’s Urban Development Department, headed (you guessed it!) by yet another IAS Officer. For instance in Maharashtra, if a city finds that its industries are moving further out from the city centre and the large swathes of land under factories will remain unutilised, it cannot authorise change of use to commercial or residential development, without the say-so of the State Government. So much for autonomy in local planning! This absence of qualified urban professionals (who are lifetime employees of a local government in charge of their city’s planning and development) is at the heart of misgovernance in Indian towns and cities. Without a strong local administration, it becomes impossible to elect and empower Mayors who can act as true CEOs of their cities, as in other parts of the world. However, given the clout of the Central permanent bureaucracy (which considers urban local bodies as plum postings), things are unlikely to change soon, and Indian cities will have to postpone their dreams of prosperity a little longer yet… no matter which political party is in power. Next Post Is La Liga killing off the World Cup?